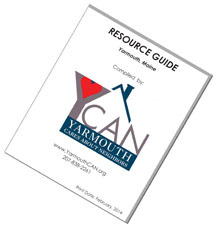 The following local organizations provide services to the Yarmouth, Maine community. Many are also listed (with more information) in our downloadable and printable Resource Guide. If you would like to have your organization’s services listed here, please send an e-mail with the information you would like listed (or updated) to: ycan@ycan.info. Thank you!